Citation Information: J Clin Invest. 2014;124(2):553-563. https://doi.org/10.1172/JCI69804. 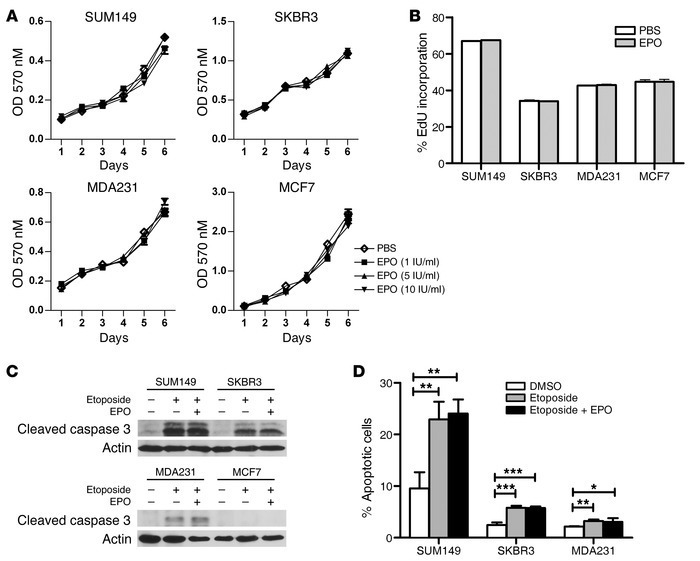 EPO does not affect human breast cancer cell lines in vitro. (A) Indicated cell lines were cultured in the presence of increasing concentrations of EPO (1, 5, and 10 IU/ml, replenished every other day), and proliferation was detected by MTT assay. (B) Cell lines were cultured in the presence of PBS or EPO (1 IU/ml) for 16 hours and EdU for 1 hour. They were then analyzed for EdU incorporation by flow cytometry. (C) Indicated cell lines were treated with vehicle, etoposide (50 μM), or etoposide (50 μM) and EPO (10 IU/ml) for 24 hours. Whole-cell extracts were Western blotted with the indicated antibodies. (D) Indicated cell lines were treated with DMSO, etoposide (50 μM), or etoposide (50 μM) and EPO (10 IU/ml) for 24 hours, then stained with PI and antibodies against annexin V. The percentages of cells that were annexin V positive and PI negative were quantified by flow cytometry. *P ≤ 0.05; **P ≤ 0.01; ***P ≤ 0.001.